The area is also known for its increasingly liberal views on lifestyle and culture, probably thanks to the influx of tourists and ex-patriots to the area. While most residents still retain somewhat traditional views on family and marriage, the gender roles in these families have been less strict in recent decades, with women finding more and more success in career options and in equality in general. Puerto Vallarta, the biggest urban center in the entire region, is particularly welcoming and supportive of women, as well as gays and lesbians who will find plenty of options for gay bars, clubs, and cultural events in Puerto Vallarta. One of the defining characteristics of the Puerto Vallarta cultural identity is the influence of tourism. The city and its cultural identity have to balance the increasingly popular tourism industry with the need to preserve historic buildings and the need to house the influx of workers that flock to the city for jobs in the industry. This fast influx of money and tourism to Puerto Vallarta also adds an imbalance in the class statuses of locals, with rich tourism moguls living in lavish summer homes alongside poor blue-collar workers living in crowded multi-family houses. 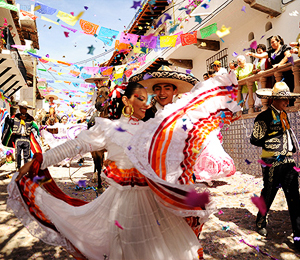 Despite its young age and its just-forming identity, the culture of Puerto Vallarta is vibrant and interesting. Walking through the streets of Downtown Puerto Vallarta, or along the Malecon, or along the charming streets of the Zona Romantica, you will get a feel for the culture of Puerto Vallarta. Talk to locals, go to local events, and check out one of the several museums.